Yesterday I found myself digging on the computer, looking at old files. 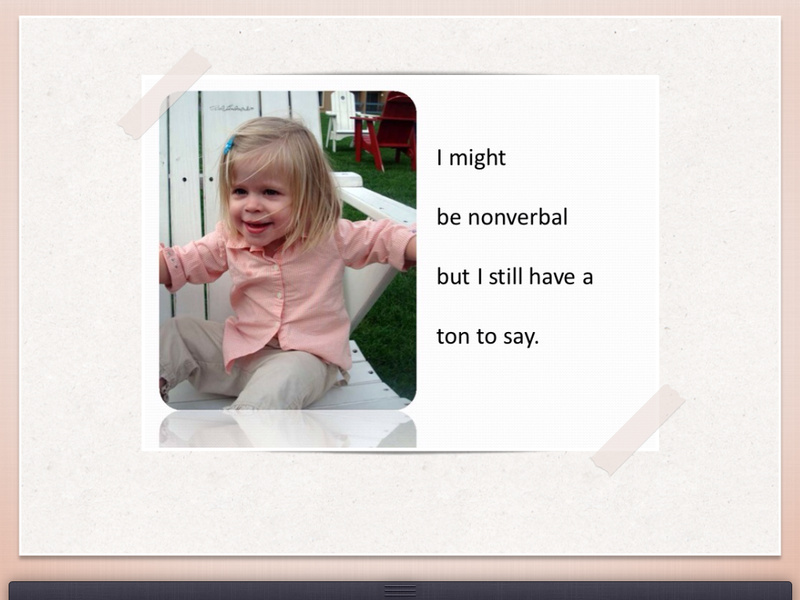 I came across a powerpoint I had made for Magdalyn’s IEP team in 2009 as she was finishing up Kindergarten. It was the first year she ever had access to general education peers since starting special education services. It made a huge difference in her ability to be flexibile and relate more to other students. One of the biggest pieces of advice I can give to other parents is that YOU are EQUAL MEMBERS of the IEP TEAM. No one knows your child better than you. Often it can be helpful to write down your thoughts about child’s needs, progress, and concerns. Brag. Revisit. Be Proud. Share your ideas. Parents are key members of the IEP team. They know their child very well and can talk about their child’s strengths and needs as well as their ideas for enhancing their child’s education. They can offer insight into how their child learns, what his or her interests are, and other aspects of the child that only a parent can know. They can listen to what the other team members think their child needs to work on at school and share their suggestions. They can also report on whether the skills the child is learning at school are being used at home. You don’t have to be a public speaker to create some materials for your child’s IEP team meeting. Write down everything you would like to be known and be recorded in the document about your child. It can be copied and pasted into the IEP document and become part of the permanent written record in the legal document. Bring along a photo of your child and place it on the table so that everyone remembers who the meeting is about: your child. Below is the powerpoint I created for Magdalyn’s IEP meeting as she was leaving Kindergarten and entering First Grade. Included are pictures from babyhood to the current day along with examples of some her academic skills and products of her learning experience. The final slides include parental input for her needs and also possible IEP goals emphasis. Autism, Special Needs and Common Core…. What are the ‘common core state standards‘ or CCSS ? What do they mean for all students? and especially for kiddos like mine on IEPs? 45 out of the 50 states have already adopted CCSS. Michigan made a motion to adopt the standards in June 2010 and began implementing them this 2012-2013 school year, with full implementation planned for the 2014-2015 school year. Some political commentators would like us to think that the CCSS are an attempt to remove educational decision making from parents and individual states. In fact, several legislative bills challenging the adoption of the CCSS have been filed in Michigan, even yesterday. Clarity. Consistency. Equal Opportunity. Exposure to Materials and Learning Experiences. Now that’s what I’m talking about–what I would want for my daughters living with autism. The Common Core Essential Elements are the output work of The Dynamic Learning Maps Alternative Assessment System Consortium. Huh? What? This video might help…. In other words, all students should have a clear, consistent and equal opportunity to learn. Differently-abled students are due the dignity of classroom instruction based on academic standards. By presuming competence in all students, we offer the opportunity to learn the power of writing, thinking, communicating, self expression, self advocacy. At first glance, the student example in the video may lead one to ask “what is the point in that lesson?” The point is that Hunter is learning the power of writing, even in its earliest forms of expression. The future development of an alternative assessment system based on the same curriculum standards for all students is one step closer to truly having an accessible curriculum and a multifaceted way of measuring knowledge of students who may learn and communicate in many different ways. The DLM consortium are working on producing a standards-based assessment for special education students that will be accessible in a variety of ways including: keyboards, touchscreens, switches, and other alternative digital access. Its future use is intended for teachers to be able to see what common core standards and essential elements their differently-abled students are taking ownership of in their individual learning. The Power of a Point….or a ‘PowerPoint’….. When Gillian was in preschool, she was a solid user of a low-tech AAC (Augmentative Alternative Communication) system called PECS (Picture Exchange Communication System). She had over 200 words that she identify receptively in a verbal behavior program. I felt she was ready to begin exploring some type of high-tech AAC system–one that would give her an even stronger communicative presence by giving her voice output. This is the slideshow I created to explain Gilly’s story to the IEP team and how more robust assistive technology could benefit her. I included images from her babyhood and toddlerhood. I included pictures of her sister. I included pictures showing her interest in dynamic display, cause & effect, and a presentation from CSUN 2009 about PECS Methodology in High Tech AAC Devices. Gilly could continue to use PECS while adding another layer, a second AAC system–one giving more perception to communicative intent and a more noticable impact to those around her by providing voice output. The CSUN presentation demonstrated that PECS is an excellent low-tech device to use previously AND concurrently with high-tech AAC. Within a few months, the IEP team was on board and in agreement. The High-Tech AAC train was now leaving the Gilly station.